Please take a moment to review our spa policies. Our courteous staff is available to answer any questions you may have. Please feel free to contact us. Our spa prides itself on providing the best experience that you can ask for. Services include a consultation time before and after your session as well as undress and redress times. Typically that will use 10 minutes or less. Please arrive 10 minutes prior to your appointment time to allow for check-in. If you are visiting for the first time there may be a consultation or intake form to complete. We welcome our guests to arrive early and relax with a cup of tea or hydrating water blend to enjoy the full effect of our spa. We may be unable to extend a late arrival's scheduled service so as not to inconvenience our other clients. If you are later than 15 minutes, we reserve the right to cancel your appointment. When you arrive for your appointment, especially if you are a first time client, any time to complete paperwork, use of the restroom or other interruptions, will be deducted from your appointment time if it runs into your scheduled service time. If we are unable to perform your service you will be responsible for the full price of your scheduled service(s). If you must cancel or reschedule your appointment we kindly request you notify us 48-Hours in advance to your service time so we may schedule another client from our waiting list. A credit card, gift certificate / card or online voucher number is required to secure an appointment time. At the time your appointment has been scheduled, the credit card used to reserve your appointment time, whether this appointment is for yourself or family or friends, it is ultimately the card that will be charged for any fees incurred if the service is canceled, changed, you do not show up for the appointment or rescheduled. You may change, reschedule or cancel your appointment without charge up to 24 hours preceding your appointment. Same day cancellations will be charged 50% of the scheduled service price Monday through Thursday. Same day cancellations will be charged 100% of the scheduled service price Friday through Sunday. If you do not call to cancel your appointment or do not show up for your scheduled appointment, you will be charged full price for the scheduled service. Should any of these situations apply to you, by giving us your credit card information you are authorizing this charge to go onto your credit card, prepaid balance, a business credit balance or gift certificate / card. Our office confirms appointments by email, phone or text message. In order to reserve your appointment, you will be asked to provide a credit card number to hold your service time. Not to worry we will not charge the card unless your appointment falls under our Cancellation & No Show Policy. Please see above policies for applicable fees. We understand that emergencies can arise and illnesses do occur at inopportune times. If you have a fever, a known infection, or have experienced vomiting or diarrhea within 48 hours prior to your appointment time, we request that you cancel your session. Inclement weather may also result in the need for late cancellations. We will do our best to give advanced notice if we are closing or need to cancel due to bad weather and we ask you to do the same. Please do not risk your own safety trying to make your appointment. Late cancellation due to emergency, illness, or inclement weather will generally not result in any missed session charges, but this is determined on a case-by-case basis. If you do need to reschedule, change, cancel your appointment before or after the hours the spa is open for business the time in which you leave your message will be the time used to determine if you will incur any fees. We do understand emergencies come up and appreciate the notice you are able to provide and each situation will be taken into consideration at the time of occurrence by Management. It is always best to speak with a professional when a service has been previously scheduled. During holiday breaks the office is closed and messages may be periodically but changes will not be made until we are officially returned to the office. If something does come up and email is best. The time stamp on such correspondence will serve as the deciding factor in any occurrence of policy fees. When reserving an appointment for friends, family or a couple you will be asked if you wish to hold the reservation under your profile or individually. If you decide to reserve the appointments under your name and your credit card, gift certificate or voucher number you will be held responsible for any fees should any be incurred. To reserve a Spa Package with us a 50% down payment of the total charge will be required at time of booking. Services that fall into this category: Appointments that would run more than 1 1/2 hours or 3 (or more) services having been scheduled at one time. If you must cancel or reschedule your appointment for a spa package / special service we request notice 48-Hours in advance. With less than 48-Hours prior notice a Cancellation fee will be assessed of 50% of the package total cost. With less than 24-Hours prior notice a fee of 100% of services reserved will be assessed. Your Therapists are reserved especially for you. Cancellations and no-shows affect our staff and other clients greatly. A 20% gratuity can be added to each package purchased. Percentages are calculated on the total amount of the service prior to any discounts (discounts will be applied if applicable). 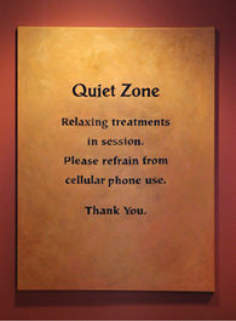 Please refrain from the use of cellphones or loud voices while in the office. If at any time your behavior is not that befitting our spa, you may be asked to leave or your session may be ended. Inappropriate Behavior Policy Massage therapy is for relaxation and therapeutic purposes only. There is absolutely no sexual component to massage whatsoever. Any insinuation, joke, gesture, conversation, or request otherwise will result in immediate termination of your session and a refusal of any and all services in the future. You will be charged the full service fee regardless of the length of your session. Depending on the behavior exhibited we may also file a report with the local authorities if necessary. Treat your therapist with respect and dignity and you will be treated the same in return. In this day and age there are so many ways to reach each other. We do confirm appointments with a phone call 48 hours in advance, an email at the time of scheduling and 24 Hours in advance. We will at times if we are unable to reach you via voicemail or email send out a text message confirming your appointment. When cancelling an appointment it is imperative that the office is contacted and a spa professional is notified. Emails and text messages may not get to us in time and you may incur fees based on our No Call / No Show policy. If leaving a voicemail please be sure to speak slowly and clearly and repeat your phone number at least twice. Sometimes there is interference on the line when the message is being left and we are unable to transcribe your message. All spa guests must be 10 years of age or older. Junior spa-goers between the ages of 10 through 15 can enjoy spa services, teen facials, manicures and pedicures, and eyebrow or lip waxing. Junior spa goers between the ages of 16-17 can enjoy the previous list of services as well as a massage. All guests under the age of 18 must bring a signed Guardian Consent Form. Please notify our Spa Consultant before reserving your treatments if you are pregnant, or have high blood pressure, special physical concerns, or diabetes. All spa guests will be asked to complete a brief questionnaire upon check-in, designed with your well being in mind. If you refuse to complete the required paperwork or do not disclose all of the pertinent information you may be asked to reschedule your appointment until the paperwork can be completed. If you must cancel or reschedule your appointment and it has been prepaid, we request notice 48-Hours in advance to avoid any Spa Policy Fee. If a promotional value expires we will still honor the amount paid at the time of purchase. This includes packages purchased throughout the current year. We love and appreciate your patronage and look forward to serving you! When booking your appointment you will need to provide your coupon code / voucher number. Once an appointment is scheduled you will need to follow the Cancellation & No Shows Policy and Arrivals Policy. If your appointment is not cancelled or rescheduled prior to 48 Hours your coupon / voucher will be considered redeemed at full service value. We apologize for any inconvenience this may cause, but your Therapist or Skin Care Professional has been reserved especially for you. Cancellations and No Shows as well as late arrivals affect staff and other clients greatly. Your understanding is appreciated. Gift Certificates and prepays are non-refundable and completely transferable and may be redeemed for any of our services that you choose. Gift certificates expire 180 days after the issue date unless otherwise noted. Original gift certificate must be physically present to be redeemed and to schedule / hold your appointment time. If certificate is not available at the time of booking, a credit card will be required to reserve your appointment time. We are happy to offer our guests the opportunity to purchase gift certificates with our affiliates Paypal and Square. We will request that the gift certificate be redeemed at the time of booking for the full value of the certificate. At which point, a credit will appear on your spa account. If the certificate was purchased by someone other than yourself we will require a credit card to reserve the appointment at the time of booking until the certificate has been redeemed. The Spa accepts cash, checks, MasterCard, Visa, American Express and Discover, or gift certificates as payment. At the time your appointment has been scheduled, a credit card will be required to reserve your appointment time. Whether this appointment is for yourself or family or friends, the credit card on file is ultimately the card that will be charged for any fees incurred during service. We proudly recruit and train our staff to be the most qualified spa professionals in the industry. You may opt to leave gratuities for our qualified spa professionals. Gratuities are graciously accepted. Gratuities are not included in the price of our individual services. Our recommended range is between 15% and 20% of the price of the service provided, but the amount is left up to your discretion. We are pleased to present each of our Guests with the opportunity to receive spa services at a discounted rate. Discounts cannot be combined. Each client is allowed to use one discount per visit. Discounts are not available for fees assessed to No Call / No Show, Late Arrivals, Less than 24 Hour Notice appointments. We appreciate your understanding. As we know, life happens. If you find yourself in a jam allow us to put your mind at ease. Memberships can be gifted one time to a family member or friend. Please see our Membership Guidelines for further details. If you are not satisfied with the merchandise that you have purchased, you may receive a store credit within 10 days of purchase provided it is returned as originally sold. However, we cannot issue credit for merchandise that has been opened unless a medically proven allergic reaction is determined by a physician. At which time, the merchandise needs to be returned to the CSRA Wellness Centers within the time frame of 10 days. If a credit card was used at the time of purchase, that card will need to be presented to be refunded on. Refunds can take 9-14 business days to complete. From the time of purchase on a credit card, a refund can be credited to that card up to 60 days from the day the spa accepted the payment. After which, a refund can be granted on a case by case basis by the owner of the spa. At the time of refund only the monies actually received by the spa can be refunded (less any credit card percentages and / or fees.) Fees after 60 days are the sole responsibility of the purchaser. Gift cards and certificate cannot be refunded for cash. We are constantly expanding our services to bring you the latest and greatest. Although we make every effort to keep our website and spa menu updated, please note that prices and services are subject to change at any time. We love having you as a client, but we do reserve the right to refuse service at any time, to anyone, for any reason.